Educating in the 21st Century: Jumping on, Jumping off! Ok, so it is playoff time in the city of Vancouver. The Vancouver Canucks are amidst the first round of the Stanley Cup Playoffs. 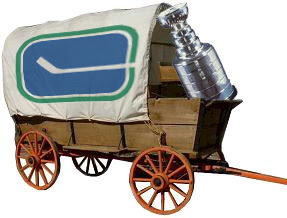 Truth or not, the fans of Vancouver have often been described as bandwagon fans. Apparently, we jump on board when things are going well and jump off as soon as the tide turns against us. Those of you who follow NHL Hockey know that the Canucks won the first three games of their playoff series to jump out to a 3-0 series lead. All over the city, I heard talk of a four-game sweep, questions about who the Canucks might face in round 2, accolades being tossed around about the stellar play of goalie Roberto Luongo, the defensive play of Ryan Kesler and the offensive contributions of such a deep defensive core. Everything seemed so rosy and the Canucks were gaining new fans each day! Well low and behold, the past three games have not gone the same way. Chicago dominated play in Games 4 & 5, found a way to win Game 6 and have shifted the momentum in their favor heading into the deciding Game 7. The talk of the town is now Roberto Luongo's poor play, Ryan Kesler's lack of offensive contributions and whether coach and player changes are necessary if the Canucks completely collapse. Many of those so-called 'fans' have quickly become skeptics. So, compare bandwagon hockey fans to educators' responses to new initiatives in education. New initiatives are brought back to schools all the time. Think of the last time you brought back a fresh idea from a workshop, conference or conversation with other educators. Hearing the benefits and gains experienced by others, you probably got quite excited about the possibilities of implementing the idea in your school or classroom. Your excitement likely caught the attention of some of your colleagues and they probably demonstrated their interest in the initiative by asking you for more details. Exciting times, right? A chance to really push forward with something innovative, right? Full of enthusiasm, you probably started implementing it in your teaching and crafting plans for getting others on board. Sometimes initiatives stick and become part of your regular repertoire of skills and strategies that you draw on from time to time. Other times, you experiment with limited success, your excitement fades and gradually the initiatives fall into your 'black hole' of passing educational fads. Each of us has our own 'black hole' of passing educational fads, full of strategies that might have worked for others but for some reason just didn't work us. Sadly, when we allow our enthusiasm to drop off and we no longer push forward with new ideas, we default back to doing things the way we have in the past...sigh, the status quo. Staying on board and pushing forward with new ideas is never easy. You need to remain committed to its implementation even when you aren't met with immediate success. You need to challenge yourself to build upon your successes, and reflect rather than be critical of your failures. You must be willing to defend the merits of your ideas and acknowledge the need to improve upon its limitations. And more than anything, you must continue to envision where the initiative will take you, your colleagues and your students once you successfully implement it. I have jumped on board with Assessment for Learning, Professional Learning Communities, Professional Learning Networks, Personalized Learning and Technology Integration. Although I know it won't always be easy and at times I may face adversity as I move forward with these ideas, I am committed to staying on board and advancing these ideas for myself and with others. I challenge you (in your next blog or tweet) to define the initiatives you are jumping on board with and to not jump off the bandwagon! Aaron, what a great challenge. I was just thinking about what to write about this week - now I have the motivation. Upon first glance, I wondered if you have taken on too many intiattives. The concern being you may be too spread out to go deep into any of them, but as I thought about it I see how they are inter-related (even interconnected?). That coupled with the fact that your initiatives are going to make learning better for the students (and staff) at your school will serve you well. Now if the Canucks can pull out game 7 tonight we can all take a deep breath and enjoy the ride! Darcy, thanks for the comment. Interestingly enough, as I was writing things down, I thought that it was quite an ambitious list as well. I should probably clarify that AFL and Personalized Learning are more at the interest level. PLC's, PLN's and tech integration are moving in the direction of initiatives. At Delta Secondary we embarked on a model that embeds collaborative time into our timetable for an hour every other week. We continue to learn as the process evolves but it is clear that all of us on staff are benefiting from the opportunity to collaborate on different projects, inquiries, etc. PLN's were new to all of us at the school this year. In fact, it is only since mid-October that a few of us started to explore it use. Since then we have grown the network of staff who are connected on Twitter to just over 20 people. Slowly but surely, we are all realizing how powerful it can be to be connected globally with other educators and hear their perspectives. When it comes to technology, I have never considered myself to be a guru at all. In fact, in the past I felt as though I was playing catchup in this area. Throughout the course of the school year, I have committed to playing around with technology and introducing colleagues to new ways of implementing technology in ways that support student learning. We have worked with classroom blogs, social media and some text polling. Once again it has proven to be a great learning opportunity for all of us. What I believe is important is that whatever a person decides to explore or move forward with, he or she must commit to it for quite some time in order to generate and maintain momentum. Some initiatives can be done on an individual basis in the classroom, others may be larger scale and involve multiple people on staff. In the months ahead I hope to revisit this post and share some of the successes we have experienced.